Warning: Melting lead and casting lead will expose you to and others in the area to lead, which is known to cause birth defects, other reproductive harm and cancer. See instructions on reducing exposure supplied with the product. Welcome to Real Pro’s SportFishing’s Special Sinker and Lure Mold portion of our on-line catalogue. With the many questions regarding casting lead jigs and other lures we thought it appropriate to create this dedicated section in our on-line catalogue. This section is dedicated exclusively to molds, so it will be of special interest to the lure maker who enjoys casting their own lures. All of our molds may be used with lead, tin, bismuth or bismuth/tin alloys. There are a few molds we recommend that you cast with pure soft lead. 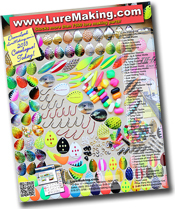 You will also want to download your own copy of our two complete catalogues packed with thousands of lure parts and components. Molds and accessories that are listed in Red are Special Order molds (molds we do not stock but order once an order has been placed for them). The molds listed in Black are always in-stock. All Special Order molds and accessories are available to you. Please allow two to four weeks for delivery to us for any Special Order molds and accessories. We also require a down payment of at least 50% of the item(s) being special ordered. The molds and accessories stocked are popular with Canadian anglers. Please note all special order mold sales are final. As you can see there are several different collar designs. Below is a brief description of each collar design. NO COLLAR Preferred by many who tie flies and other experienced lure makers. One of the more difficult collars to wrap, it can make the most effective jig using a minimum of material. It is tied by first wrapping the desired hook with thread, building as thick of a threaded base as desired. Material is then added and wrapped. With practice, tying to the hook is fast and gives more action to the material. COLLAR WITH BALL Easy to tie, especially for beginners. The ball on the end prevents a loose wrap from slipping off the collar, provides a natural stop for the material being tied. The ball will also hold plastic grubs. COLLAR WITH BARB Made to secure plastic bodies on the jig. The barb is usually positioned on the top side of the collar. Barbs positioned on the collar opposite the hook are called reverse barbs. HOLDER COLLAR An all purpose collar made to hold plastic bodies and rubber skirts. It is also easy to tie material on the holder collar. FLAIR COLLAR A thick collar made to flair bucktail, crimped nylon or other wrapped and tied material. We stock three basic models of molds. Each serves a different purpose for the user. ASSORTED These are very popular because the assorted sized models enable the user to produce a variety of sizes from on mold. Assorted size models cast one each of the sizes listed. COMBINATION Combination size models enable the user to obtain faster production of popular sizes. Features multiple cavities of two different sizes. Combinations are popular with fishermen and many manufacturers. PRODUCTION Production models feature several cavities of the same size to achieve maximum production speed. Popular with manufactures or fishermen using large quantities of one particular size. Real Pro’s SportFishing does not accept custom work! Blank Molds are available because of the numerous requests for special designs or custom work that we receive. Real Pro’s SportFishing does not offer custom services nor can we make special order molds from these blank molds. They are offered only as a service to our customers to use as the basis of a do-it-yourself project. Tool and die or machine shops often have the capability to do this type of work, and the blank mold serves as a good basis to start. It is machined and assembled the same as our other models, the only difference is that it has no cavities. Custom projects can often be very difficult an expensive. It would be wise to find a machinist who will accept your project and get a cost estimate before ordering a blank mold. Our molds are the finest molds available for casting lead lures and sinkers. Do-It Molds feature sturdy replaceable handles for insulation from heat. The molds are machined from hard, warp resistant aluminum alloy. The mold faces are machined smooth and flat to minimize flashing. Hinges are sturdy and fit tight. Styles and size of hook or insert is permanently marked on each mold. All of these molds may be used with lead, tin, bismuth or bismuth/tin alloys. There are a few molds we recommend that you cast with pure soft lead. Lead can usually be purchased locally. Look in your local "Yellow Pages" under the headings of "Scrap Metals", Scrap Yards", "Recycling Services" and "Metal Dealers" for sources of lead. Lead Free Solder is usually made from pure tin or tin with a small amount of silver and may be purchased from any plumbing hardware store or plumbing wholesaler see "Plumbing Whol & Mfrs" in you local yellow pages.